I just bought a very small prayer book approximately forty years ago and you still can get it on the internet. The book is called “The Pieta Prayer Book.” I highly recommend it, it is one of the best prayer books you will ever find and it doesn’t cost that much money to purchase either. When I first got this book I opened up to this prayer. I didn’t realised it was a prayer of exorcism, if I had known it I wouldn’t of start to read it, because I would have been too fearful to do so in those days. As I started to pray I felt the presences of exorcism so incredibly strongly, that there was no mistaking the prayer was being answered. The presence of exorcism filled the whole room and I was scared, but felt now that I started this prayer I better finished it. 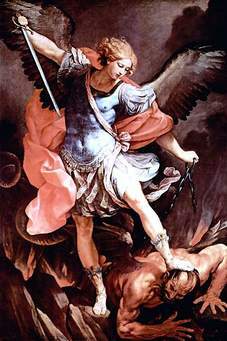 St. Michael the Archangel, defend us in the day of battle. Be our safeguard against the wickedness and snares of the devil. May God rebuke him, we humbly pray, and do thou, O Prince of the heavenly host, by the power of God, cast into hell Satan and all the other evil spirits who prowl through the world seeking the ruin of souls. Amen. Some people have problems praying to angles, they think we are not allowed to do this. St Michael and all the angles and saints in heaven are our brothers and sisters in Christ Jesus, I think it would be strange, not to talk to our family members. If we are in need of help the family members are usually the first people we call on for help. To me there is no difference with our spiritual family in Christ. I believe they are more our brothers and sisters then our earthly family in many cases. Pope Leo Xlll composed this prayer after seeing a vision of the great fierce battle between St. Michael, and Satan over the Church. I would love to read up more about this Pope, because he is so completely the opposite of Pope Francis. Pope Leo does warned about attacks of the Catholic Church in the latter days and what to look out for. Our Lady appeared in Garabandal in 1961, I think it is a place in Spain. She told one of the children how many more popes there will be in the future and Our Lady told her that one pope she doesn’t count. That pope is Pope Francis, he is clearly if you look into what he is doing is the false prophet which the prophetess Maria Divine Mercy warned us about, at the beginning of his reign as pope. There is a site that I just found on the internet, it is very informative on how Satan is attacking the Catholic Church and the address is Facebook.com/defeatmodernism.